Every time an unheard of indie developer comes onto the scene touting a unique new title, my heart begins to warm. This is what the videogame industry used to be about, after all: A bunch of upstarts would release an utterly innovative game, and the rest of the industry would take notice. When The Escapist first got its hands on developer Renegade Kid’s Dementium: The Ward, the unfinished product looked surprisingly impressive. Who could help but to be excited for a spooky Nintendo DS survival/horror-FPS hybrid with fantastic visuals and atmospheric audio? Once I actually got my hands on the game, however, it became clear that Dementium is just about as innovative and scary as being locked in a closet. But it’s not necessarily an abomination, either. 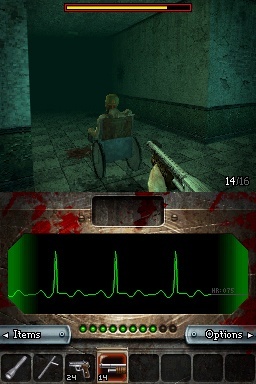 The game pits you as some maybe-murderer who wakes up in a wheelchair in the most hellish hospital ever. You don’t know your identity and are given no real goal. Your first course of action is obvious, though: Get the hell out of this maze of blood-encrusted corridors before an acid-vomiting zombie eats you. Dementium wears its Resident Evil, Sanitarium and Quake influences on it sleeve, for better or worse. The story elements tend to be derivative of any number of boring survival/horror plots. It’s disappointing that a title with such a solid look and spooky ambiance has a downright throwaway story. You use the stylus and bottom screen of the DS to look around the dingy environs, a method which is at first extremely intuitive. The controls are similar to Metroid Prime: Hunters, but Dementium pulls them off with a little more polish. When you first receive a flashlight, it's a treat to peer into the darkness. For some reason, though, without the flashlight you can only see about two meters in front of you. This is cool during the exploration portions of the game, but absolutely horrid during combat sequences; enemies often come out of nowhere and attack from where you can’t see them. Couple this with the absurd limitation that you can’t hold a weapon and flashlight at the same time, and it becomes an annoying nightmare to battle certain enemies. This also keeps the game from being scary at all. Didn’t Renegade Kid play Doom 3? Technically, Dementium is superb. The combat feels great when you have enough light to effectively target your enemies, and the game runs at a smooth 60 frames per second throughout. The environments are atmospheric, despite the fact they all look the same; expect to roam through countless indistinguishable hallways and offices. Moving from room to room breaks the atmosphere as well, since the screen cuts to a jarring black as you walk through doorways. The music is dreary in all the right ways, and the sounds in the game, from the cries of monsters to the report of your weaponry, are quite crisp. Layered behind the music is an easy to disable heartbeat that adds a bit of tension to the action. Dementium’s gameplay is where its most troubling faults begin to show themselves. The game is so linear as to be a series of line segments. The game features 16 chapters that take you through a series of identical-looking corridors, fighting the same five enemies the whole time. Level design becomes more varied later in the game, but it is often tedious to navigate around levels where every room looks the same.